Learn how to crochet 3D puff flower using a very easy to follow step by step tutorial. Let’s make these gorgeous little flowers in the best possible way. Some experienced crocheters already know that there are hundreds of different designs for crochet flowers. As usual, flowers are simple and fun projects because they work up quickly and do not require much yarn. 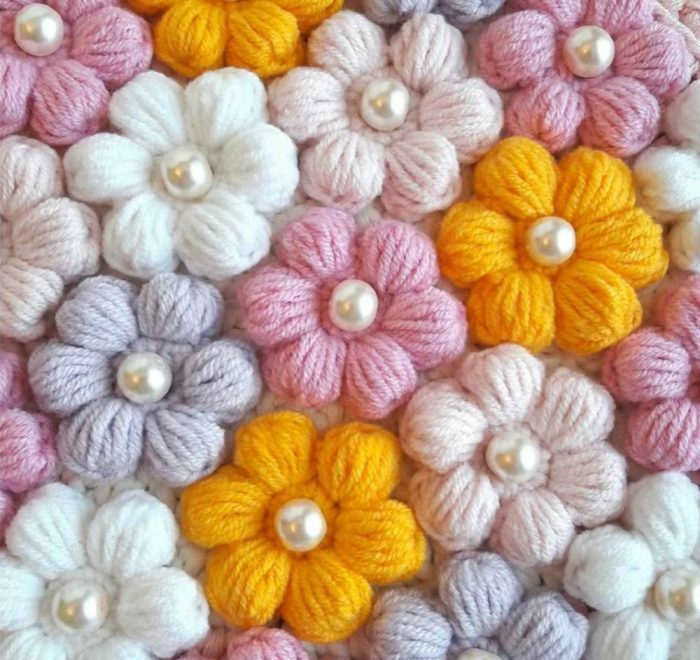 Crochet flowers appear to be just perfect for a diverse array of projects. They can be used as an appliqué on almost everything, from hats to shoes. Flowers can be strung together as bunting and placed on tables as coasters. You can also use them in large-scale works of art and this is probably what makes them such a special project for each and every crochet lover. In this simple and easy to follow tutorial, I will show you how to crochet puff flowers in different colors with a small bead in the middle. Just take your time, follow the instructions and you’ll be able to make this lovely puff flower in just a few minutes or less. Good luck! In this tutorial, I will show you how to crochet these beautiful 3D puff flowers in the easiest way. Follow the instructions and enjoy yourself. This is a very quick and easy pattern to follow and there is no doubt you will handle it without any problems. Just follow the video instructions and decorate your future projects with these colorful puff flowers.